It’s small—a framed print just over five by seven inches. There’s a sticker on the back: “GREEN BRIDGE (Built 1902) between Newburyport and Salisbury, Mass. 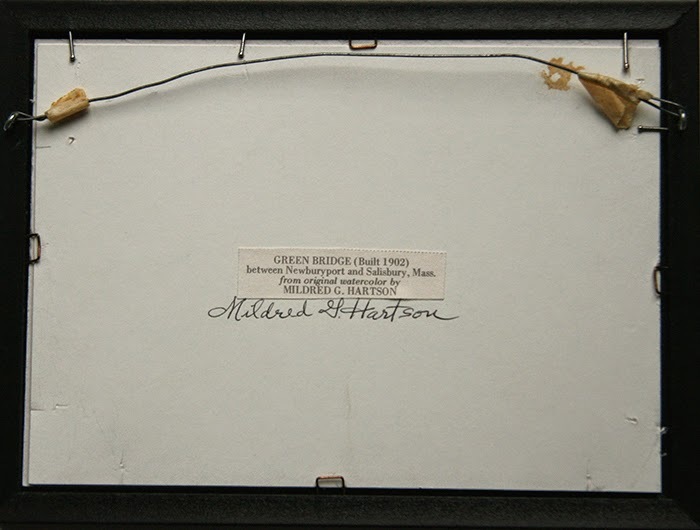 from original watercolor by MILDRED G. HARTSON. It’s signed with the artist’s signature on the mat and on the back. I recently purchased it at Flukes and Finds. I had to buy it, not for the image but for its creator. In a roundabout way, I had unfinished business with Millie Hartson. 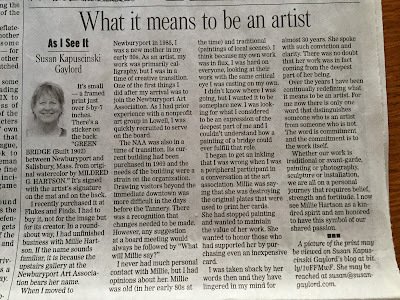 If the name sounds familiar, it is because the upstairs gallery at the Newburyport Art Association bears her name. I never had much personal contact with Millie, but I had opinions about her. 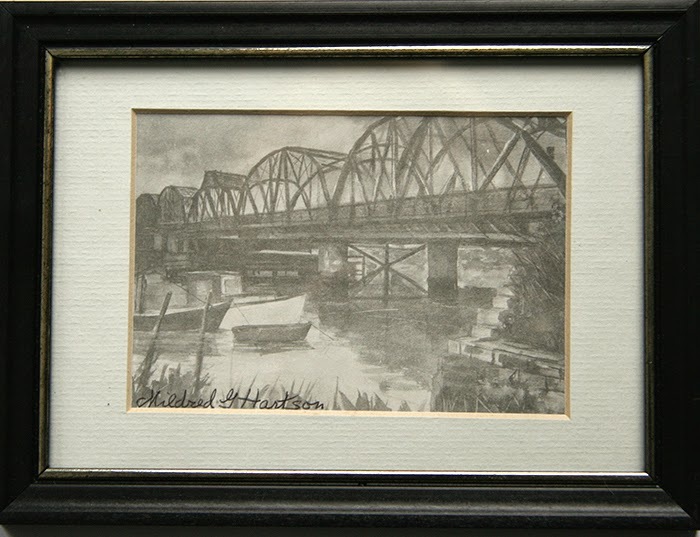 Millie was old (in her early 80s at the time) and traditional (paintings of local scenes). I think because my own work was in flux, I was hard on everyone, looking at their work with the same critical eye I was casting on my own. I didn’t know where I was going but I wanted it to be someplace new. 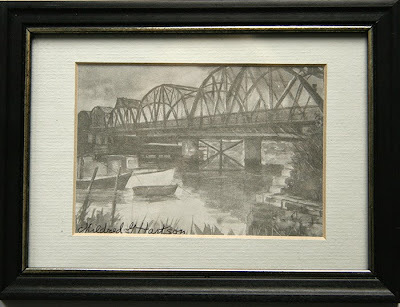 I was looking for what I considered to be an expression of the deepest part of me and I couldn’t understand how a painting of a bridge could ever fulfill that role. 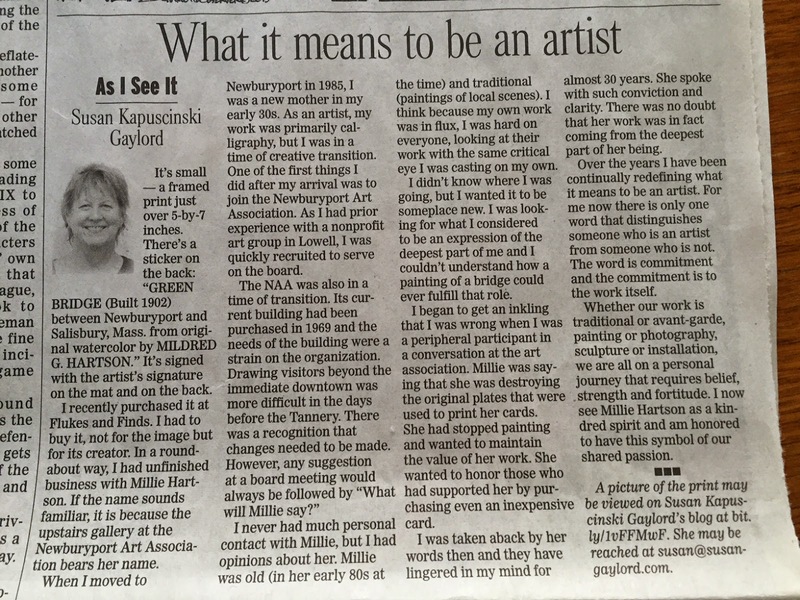 I began to get an inkling that I was wrong when I was a peripheral participant in a conversation at the art association. Millie was saying that she was destroying the original plates that were used to print her cards. She had stopped painting and wanted to maintain the value of her work. She wanted to honor those who had supported her by purchasing even an inexpensive card. I was taken aback by her words then and they have lingered in my mind for almost 30 years. She spoke with such conviction and clarity. There was no doubt that her work was in fact coming from the deepest part of her being. Over the years I have been continually redefining what it means to be an artist. For me now there is only one word that that distinguishes someone who is an artist from someone who is not. The word is commitment and the commitment is to the work itself. Whether our work is traditional or avant-garde, painting or photography, sculpture or installation, we are all on a personal journey which requires belief, strength, and fortitude. I now see Millie Hartson as a kindred spirit and am honored to have this symbol of our shared passion.